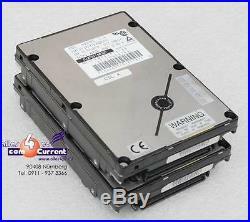 4 GB FUJITSU HARD DRIVE HARD DISC HDD MAB3045SC CA01606-B39900SE SCSI SCA #K040. The description of this item has been automatically translated. 4 GB Fujitsu SCSI SCA server hard disk with 80-pin. Condition: Top, fully functional, from running. Do you want to see more hard drives? We have HDD 50 pin. The item "4 GB FUJITSU HARD DRIVE HARD DISC HDD MAB3045SC CA01606-B39900SE SCSI SCA #K040" is in sale since Thursday, October 13, 2016. This item is in the category "Computers/Tablets & Networking\Drives, Storage & Blank Media\Hard Drives (HDD, SSD & NAS)\Internal Hard Disk Drives"." and is located in Nürnberg.